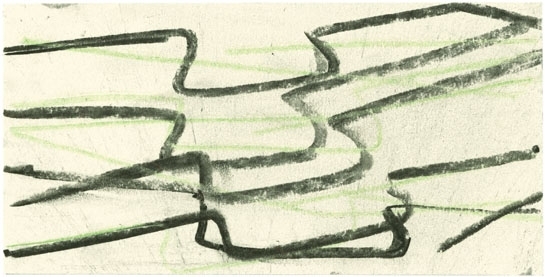 Ronald Noorman, on the other hand, has chosen drawing as the primary vehicle for his imagination. What attracts him in drawing is the directness of the medium. Drawing reduces to a minimum the distance between idea, hand movement and the sign appearing on the paper, from the perspective of both time and space. The technical tools –pencil, crayon, water-colour, gouache- are a lot less inflexible than oil paint, copperplate, or stone and naturally lend themselves more easily to experimentation: failures or rejects are referred to the bin. However, drawing knows no mercy; wiping or covering up of errors is virtually impossible. Moreover, it seems as if the viewer is able to look over the shoulder of the artists; that is how direct the contact is. The slightest hesitation, mistake or change of mind is immediately observed. Drawing is another form of thinking; the thoughts drawn by Ronald Noorman are so beautiful, so bewildering or so moving, they make us forget that they have been written in a language unfamiliar to us.